Panels are available in 19"H. x 18"W. and 19"H. x 36"W. sizes. Additional sizes available -- contact dealer. 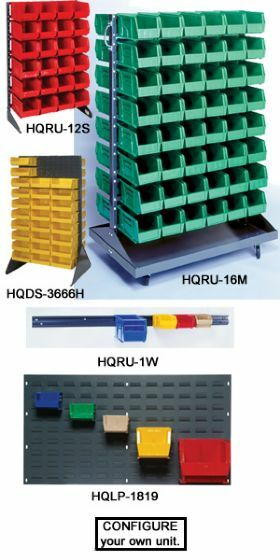 Bench racks measure 28"W. x 21"H. x 8"D. and 36"W. x 19"H. x 8"D. Single sided, double sided and mobile units are available in both louvered panels and racks. Standard color is Gray. Some models are available in Beige - see part number for option. FOB Shipping Point. No. Descript. Size L x W x H HQUS -205 HQUS -210 HQUS -220 HQUS - 224 HQUS -230 HQUS -233 HBUS - 234 HQUS -235 HQUS -239 HQUS -240 HBUS - 245 HQUS -250 HQUS -255 HQUS -260 HBUS - 265 HQUS -270 Wt. (lbs.) Price Ea. *Available in Beige -- add -BGto end of Product No. 270 Wt. (lbs.) Price Ea. Product No. For Use With Description Wt. (lbs.) Price Ea.